Another week with too much work and not enough reading so I again opted for a collection which suited my short attention span. 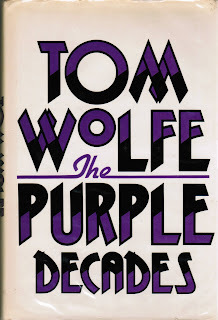 And again I opted for a Tom Wolfe collection. This book is 21 previously published stories that originally appeared in magazines and were then published in previous collections. So, this is really a " greatest hits " spanning the years from 64ish until 79ish. It covers the New York art scene through to an excerpt from the "Right Stuff" on Chuck Yeager. Some of the pieces are dated but the majority hold up and could have been written last week. Although that isn't correct because there is no one writing for magazines today that come with miles of Mr. Wolfe's ability. This is a great over view of his articles and is recommended because , oh my, how this man can write, with apologies to John Hiatt.